Habitat and Growing Conditions: Hops require a rich deep soil with a dry bottom. Pertinent Information: Febrifuge. Nervine. Diuretic. Sedative. Liver tonic. Anodyne. Astringent. Use the flowers (strobiles). Gather before they are fully ripe in August or September. Improves appetite and promotes sleep. Also, stuff a pillow with hops to bring sleep. Useful for toothache, earache, etc. It should not be used where there is depression. 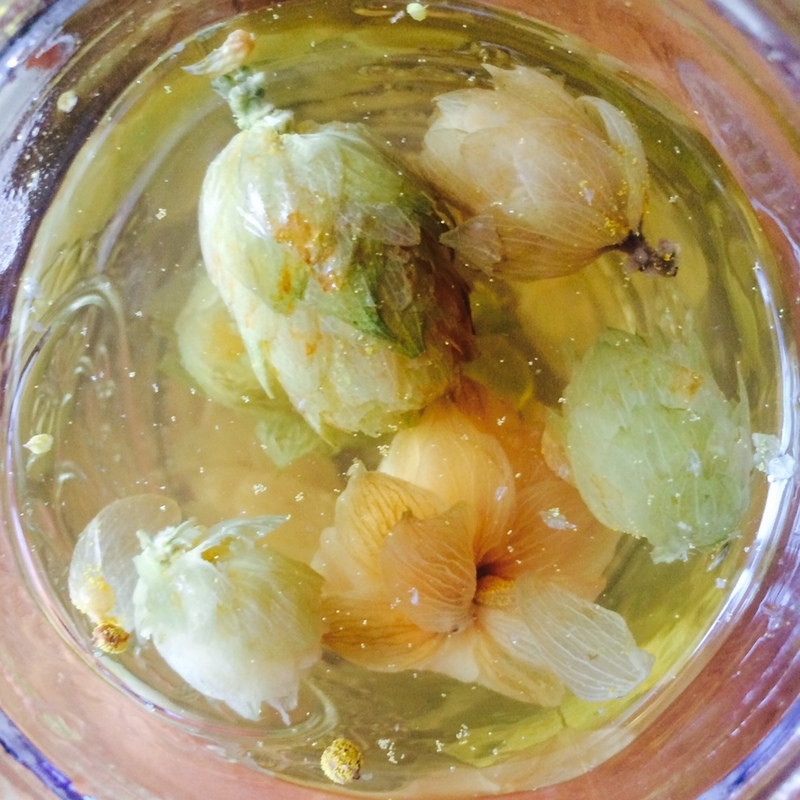 Personal Experience: Hops infusions make me think of my mother. Her hops plants grow out of control every year and produce many strobiles that I then have the pleasure of infusing for relaxing evening drinks. Spent herbs from my nervine infusion-- hops, chamomile, valerian, and red clover blossoms. Other than the red clover blossoms these are all nervines that support the nervous system, like most of the herbs I've been taking this week (skullcap, catnip, lavender). My first unit of study is the nervous system so I've been focusing on trying different nervine combinations. They ease tensed muscles, anxious minds, and insomnia, as well as tone the nervous system generally. A perfect introduction to herbalism since most people drink herbal teas to relax. My first morning infusion after receiving and excitedly digging into my herbs. Mullein leaf to help my wintery dry throat; nettles for vitamins; hops, catnip, chamomile, and lavender to bring peace to the start of my day.